The New iPad has been released for several days, but it is still a hot topic among people to debate on whether the new iPad is worthy buying or not. Although the New iPad will not be more expensive than the iPad 2, the price of it is still higher than most of Android tablets. 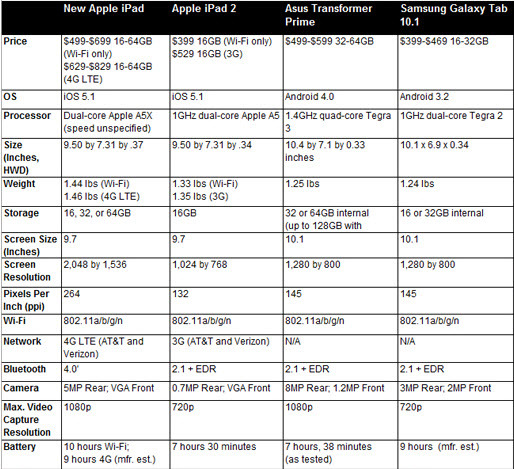 So, how can the new iPad compete with numbers of other tablets that run Android OS? Though the battle might seem a bit lopsided, it is meaningful to compare Apple's latest tablet with the best Android tablets available right now. Many tablet producers announced quad-core Android tablets at Mobile World Congress as they promised before, including Samsung Galaxy Note 10.1 and the Toshiba AT270. But the detail specs and release dates aren't solid. According to it, we can also conclude this battle with dual core processor competition. Obviously, ASUS EeePad Transformer Prime matches the new iPad closest on specs, and another Android tablet which can be compared with the new iPad is Samsung Galaxy Tab 10.1. If you're considering which worthy buying, this article may be helpful for you to make the right decision. If you want the most advanced hardware you can get now, there is no doubt that the new iPad is the best choice. The 2048 x 1356 pixels display Retina screen is unparalleled, the rear camera has been improved to 5 million pixels, and its new A5X chip with quad-core graphics should be four times faster than any other Android tablets with obvious the best smoothness and fluidity. So if you are strict with the fluency of the applications with high definition display, the new iPad must be the only choice. There is no clear evidence which is better between iOS and Android OS. The new iPad and iPad 2 run the iOS 5.1 while the ASUS Transformer Prime runs Android OS 4.0 Ice Cream Sandwich. Respectively speaking, Samsung Galaxy Tab 10.1’s Android OS 3.2 seems slightly inferior. The New iPad packs the Dual-core Apple A5X processor which is said to be four times faster than the A5 processor. The Transformer Prime and Galaxy Tab 10.1 ship the 1.4 GHz qual-core Tegra 3 and 1GHz dual-core Tegra 2. According to the data, the 1.4GHz qual-core Tegra 3 is supposed to perform best – the qual-core processor brings you not only the promotion in fluidity but also the powerful function to allow more multitasking capabilities. Though the A5X is said to be powerful enough, ASUS Transformer Prime is the most probably one who can be compared with the new iPad in processor. The screen size of the new iPad and iPad 2 are both 9.7 inches while the Transformer Prime and Galaxy Tab 10.1 equip a larger screen with 10.1 inches. Actually these four tablets ship the similar screen size if you haven’t brought them together for comparison. But the unparalleled high definition Retina screen makes the new iPad stand out. The 2048 x 1356 pixels display provides you a more authentic image experience for enjoying/reading movies, pictures and e-books. The new iPad ships 4G LTE (A&T and Verizon) instead of the 3G (A&T and Verizon) in iPad 2 while the other two Android tablets do not support the Network – neither 3G nor 4G. So if you want to experience the high network speed when you are outside, you may choose the new iPad. ASUS Transformer Prime proves itself again for being prepared to compete with the new iPad with its 8MP Rear camera and 1.2MP Front camera which are obviously better than those of the new iPad. Apple has improved the battery life for the new iPad which can support 10 hours in Wifi network and 9 hours in 4G LTE environment. And Samsung Galaxy Tab 10.1 is promised to last 9 hours for using. And, it is a pity that ASUS Transformer Prime only supports 7 hours for playing. After all, the price is the most important factor which changes final purchase behavior of the customers. The New iPad keep the price with no less than $499 which is also the original price when iPad 2 was released. And the ASUS Transformer Prime holds the similar price for a larger storage. Samsung Galaxy Tab 10.1 is sold from $399 to $469 which is relatively cheaper than either of the above two tablets. Now, which one is worthy buying depends on you. Hope you have chosen a suitable tablet for enjoying movies, surfing the Internet and playing games. 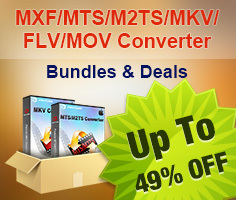 Maybe you need Pavtube Blu-ray to Apple Converter to help you rip/convert Blu-ray movie to the new iPad for watching. Just freely click and download the trial version to make it.